Take a perfectly good Volkswagen Golf Wagon, add 4Motion All-Wheel Drive, raise the suspension for improved ground clearance, add interior lifestyle goodies and what do you have? There are many good things about the on and offroad abilities of the Alltrack, given corporate cousin Audi’s long history with AWD platforms. But perhaps the best thing is you get that level of expertise in a package that’s decidedly cheaper than Audi’s excellent Allroad quattro. In television advertising for the Alltrack, VW shows the vehicle in off road situations. With a dedicated set of parameters via and Offroad mode selector for the AWD system, it’s not as off road capable as big brother Touareg, but it can handle some impressively bad roads. Deep ruts, loose gravel, water hazards and snow are among the bad on and off road conditions you’ll enjoy tackling in the Alltrack. So that takes care of the mechanical comparison, which on paper gives the nod to VW. How are things inside? As one would expect since the comparison came from VW, the all-new Alltrack shows nicely. 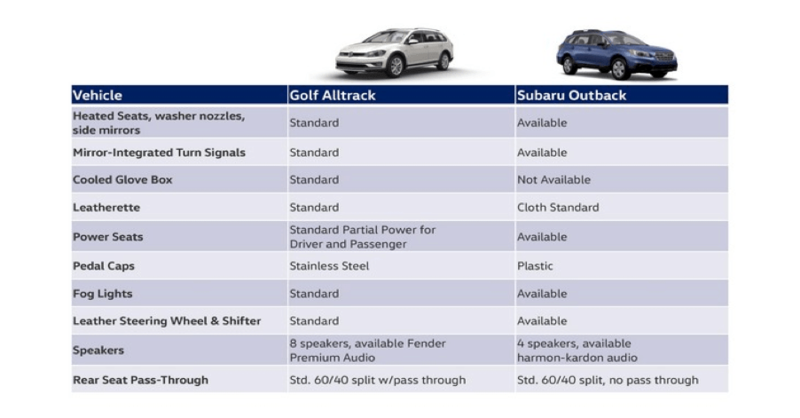 They chose comparison points that show the Alltrack in a favorable light. But I don’t have a problem with that because the categories chosen to compare are categories that matter. Engine performance? Matters. Interior amenities? Matters. The Outback wins on overall size and cargo carrying capability, and on ride height (8.7” vs. 6.9”). But the Alltrack wins on most points. Where it’s a clear winner however is in the fit and finish department. It’s really an unfair battle when cousin Audi builds what are arguably the best interiors in the business. This kind of interior expertise trickles down to Volkswagen in general, and to the Alltrack in particular. Sit behind the wheel of the Alltrack, and you’ll guess the MSRP is thousands higher than it actually is. It should be noted that the Alltrack will soon be offered with a manual transmission—not available on the CVT based Outback. The Alltrack is available in three trims: S, SE, and SEL. The $27,770 Alltrack S comes standard with a dual clutch DSG transmission and features “V-Tex” heated leatherette seats, a 6.5-inch touchscreen, 17-inch “Valley” wheels, VW Car-Net App-Connect, Bluetooth with audio streaming, rearview camera, touchscreen sound system, multi-function steering wheel, selectable drive modes and more. With Volkswagen Car-Net App-Connect available on certain models, you can access select smartphone apps right from your dash.5 Maps, messaging, music, and more can show up on your touchscreen for easy display and use. SE models ($30,530) include all S features and add: A huge panoramic sunroof, Fender Premium Audio, keyless access with pushbutton start, 115-volt power outlet, and more. During the national press launch for the Alltrack, I spent much of my driving time in the top-of-the-line SEL ($32,980), which includes all S and SE goodies and adds: Discover media touchscreen navigation, dual-zone climate control, power adjustable front comfort sport seats and 18-inch “Canyon” wheels. An $845 Driver Assistance package is available on S and SE models, and includes Adaptive Cruise Control, Forward-Collision Warning with Autonomous Emergency Braking , and Park Pilot (park-distance control). On the SEL, the package costs $1995 and includes Adaptive Bi-Xenon HID headlights with LED DRLs; Adaptive Cruise Control, Park Pilot, Park Assist automatic parking, Forward Collision Warning with Autonomous Emergency Braking, Lane Keeping Assist, and self dimming rearview mirror. At the heart of Alltrack’s go-anywhere demeanor is VW’s proven 4MOTION All-Wheel Drive system. 4MOTION transfers torque between the front and rear wheels. In normal driving conditions, power is delivered to the front wheels. But 4MOTION can also send torque to the rear axle when it’s needed. 4MOTION also works in conjunction with other active stability systems, like Electronic Differential Lock. Alltrack also features Hill Descent Control. While in Off-Road Mode, Hill Descent Control will help control the application of your brakes while going downhill, keeping your downhill trek at a constant, controlled speed. The available, customizable Off-Road Monitor in the Alltrack shows altitude, steering wheel angle, compass, and more. The 2017 Golf Alltrack is available with one powertrain, a turbocharged 1.8-liter DOHC four cylinder outputting 170 horsepower and 199 pound-feet of torque. The twin-cam setup is chain driven, which all but eliminates the belt change service intervals associated with belt driven camshafts, normally between 60-100K miles. When you’re not traversing muddy roads, the Alltrack continues to shine. It’s a Volkswagen, which means driving dynamics are part of the behind-the-wheel experience. Alltracks come standard with class leading safety equipment and features, including seven stability enhancing and control systems, but then again, it’s a Volkswagen, which means you’re driving one of the world’s safest brands of automobiles, irrespective of price point. Alltrack fuel economy is a respectable 22-mpg city, 30-mpg highway, but then you knew it would be efficient, because it’s a Volkswagen. The 2017 Volkswagen Golf Alltrack is a complete package of go pretty much anywhere, do anything lifestyle; yet attractive and docile enough to be the envy of onlookers on paved roads. Throw in world-class safety, and this is a vehicle you should consider.